Welcome to Musicarta's MIDI piano music page! If you're new to Musicarta, please browse through the tabs on the navbar and start to discover how Musicarta can help you play great popular music styles at the keyboard. If you're here on account of MidiPiano - read on! Musicarta offers MIDI piano music files to accompany its collection of online piano lessons and home study downloads, and below you will find an introduction and guide to the fantastically useful MidiPiano virtual keyboard to play them on. MIDI stands for Musical Instrument Digital Interface, and is the code computers use to read and write music. You can play MIDI files with many applications. Musicarta recommends that you download the free MidiPiano virtual keyboard for playing and viewing your MIDI piano music files. 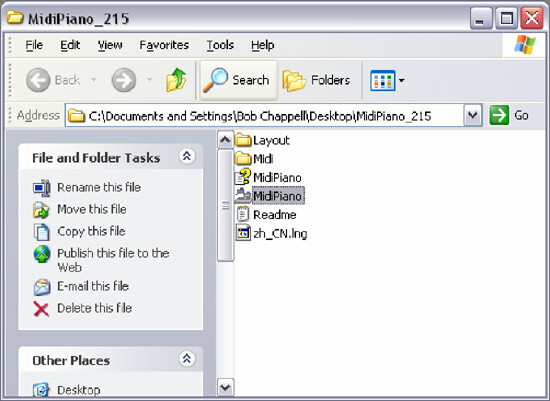 This page contains full instructions for downloading and using MidiPiano. MidiPiano has a number of excellent educational features. As it plays a MIDI file, the piano keys used light up, colour-coded according to which hand is playing, while at the same time a useful and intuitive ‘Piano Roll view’ displays the music graphically. The performance can also be slowed down to aid your study, and the hands individually muted. You can also record performances and save them as MIDI files, using MidiPiano as an introduction to MIDI sequencing. 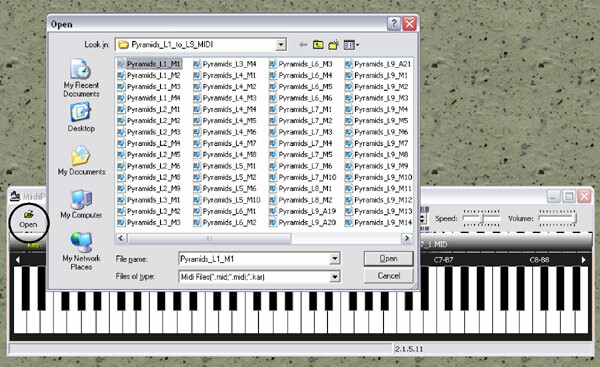 It shows a Musicarta MIDI file being played and the viewer using some of MidiPiano's great features to learn a tricky section of Musicarta's 'Pyramids Variations'. Here's the music the MIDI clip illustrates. The written-out music looks much more complicated than what the fingers actually do - isn't that the trouble with written-out music! Put the audio and the MidiPiano performance in the mix, though, and you can see how Musicarta and MidiPiano together could help you get further, faster. 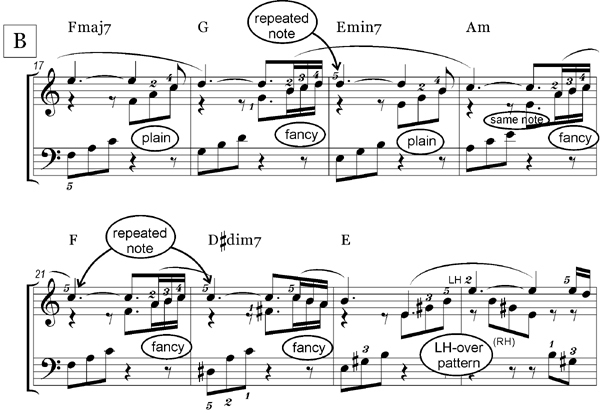 MidiPiano, plus Musicarta's free MIDI files, can help you learn to read music. Full instructions for using MidiPiano to help you learn Pyramids are given below. Stop press! Latest Musicarta home study releases! Playing a melody plus its own full, satisfying chord accompaniment is THE benchmark achievement for the modern-styles keyboard player. ‘Mariaan’ builds just such a performance, step by step – and with no-one left behind! Guaranteed to expand your creative horizons every time you sit down to work at it! Chords for Carl and Mariaan aim to fast-track beautiful piano solos into your repertoire and teach the basics of a classic popular-music solo keyboard style. Musicarta’s three 'main-course' keyboard creativity work-books are designed to put you in the composer’s seat with a combination of versatile keyboard riffs and theory-you-can-use. All Musicarta home study packs make full use of MidiPiano’s excellent educational capabilities. MidiPiano turns every MIDI file into a mini ‘how-to’ video! Drum and orchestral backing tracks to support you practicing and inspire your improvisations. It’s easy and safe to download MidiPiano so you can use Musicarta’s free piano MIDI files to improve your playing. Make sure you have ‘Save File’ selected (the radio button) and click ‘OK’. Your computer will ask you for a location to save the folder to. Choose your desktop and click ‘Save’. The download should start immediately and will be very quick. 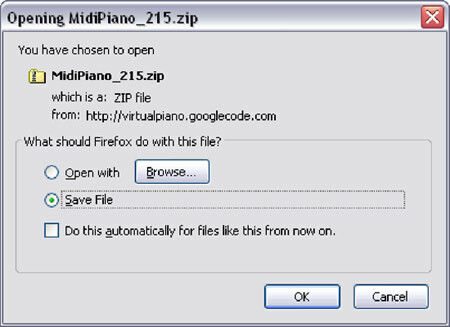 Go to your desktop and locate a zipped folder called MidiPiano215. ‘Zipped’ folders have a picture of a zip on the front of them. You have to ‘extract’ the files from them, like unpacking a suitcase. 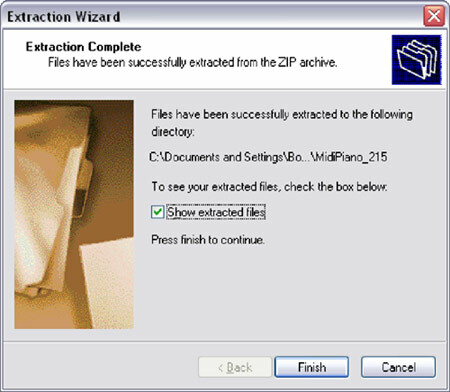 Notice under ‘Folder Tasks’ on the left the option to ‘Extract all files’ (circled). Move your mouse over the text and double-click. Click on ‘Finish’. A window will open up showing you the extracted contents. Go back to your desktop and you will now find two folders called MidiPiano_215, one with the zip feature and one without. Open both and check that the contents are the same. Now open the remaining MidiPiano folder. In the next screen shot, the actual programme icon is shown highlighted for you. 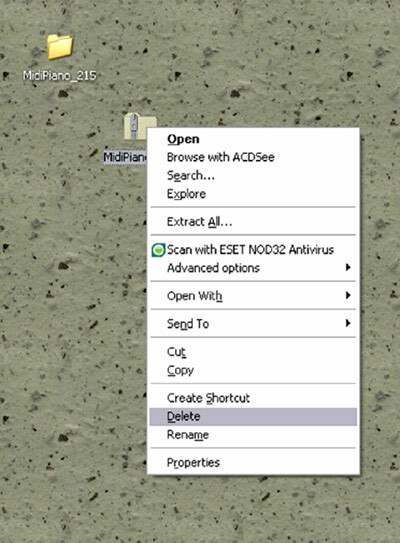 You want to create a shortcut, a button on your desktop that you click on to start MidiPiano. Right-click on the programme icon and slide down the list that opens to ‘Create Shortcut’. Drag that icon onto your desktop and close the folder window. You can put the MidiPiano folder away somewhere – you won’t need it again. 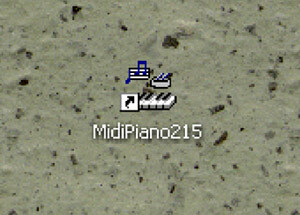 When you want to run MidiPiano, just double-click on the desktop icon. MidiPiano will run and you will see the application. Using the ‘Open’ button on the keyboard (circled), navigate to the MIDI file folder of whichever Musicarta home study package you're working on nd selet the MIDI file named in the table beneath the musical example you're about to master. 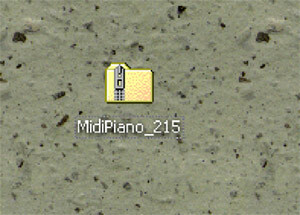 MidiPiano will open (load) the file. It won't start playing until you click Play. If you do not already see it, click on the application’s ‘Piano Roll’ button to open the useful Piano Roll pane. Press the MidiPiano ‘Play’ button and look-and-listen to your musical example playing. The keys colour up – green for the left hand and red for the right – as the moving line in the Piano Roll pane shows which note is playing. If you do not hear any sound, open the MidPiano ‘Options’ dialogue box (circled). Make sure you have an ‘Output Device’ selected (circled). Your operating system will show you a list of the possibilities on your particular system. Make sure the MidiPiano volume (circled) is set to high, and that any other volume controls on your system are set to a reasonable level. Make sure the Tracks  and  have their boxes ticked. If the hands are not correctly colour-coded green for left (the lower notes) and red for right (the higher notes), you might have to experiment moving tracks  and  around between the boxes. Here’s a run-through of the MidiPiano controls. Open This uses your computer operating system to select a file to play. Be sure to select only MIDI files (with the .mid extension). Play The ‘Play’ button toggles Pause and Resume. Record You can record your own performance, using the mouse, the computer keyboard or a MIDI connected to your computer. Stop Stops the performance and returns to the beginning. Save The current file will be saved as a MIDI file in the location you choose. 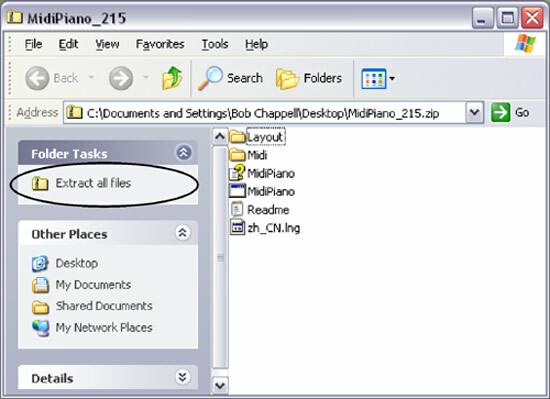 Repeat You can set MidiPiano to automatically repeat playback of the file. Piano Roll Toggles Piano Roll view. For maximum benefit, always have the Piano Roll pane open. 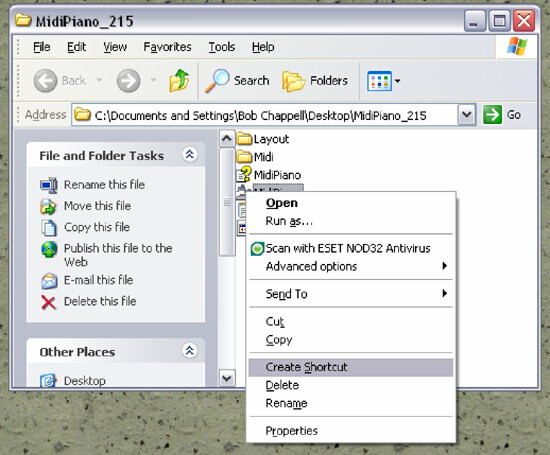 Note that the Piano Roll pane is ‘sticky’ – it will move round with the main application window. Midi Event Opens a MIDI Event pane showing all the events in a MIDI file. Options See separate section below. Key You can transpose a MIDI performance up or down by semitone steps using this control. Speed You can slow down or speed up the performance of a MIDI file. Slowing down a performance will let you see which hand does what in slow motion. Volume Controls the playback volume – in conjunction with any other volume controls in your operating system. Note also the file information in a line just above the MidiPiano keys, and the progress bar below. Clicking in the progress bar takes you to the corresponding place in the file. The arrows at either end of the keyboard determine which part of the keyboard is shown. In MidiPiano, middle C is C5. Keep it just left of centre. The Options dialogue box controls a number of functions. In the screen shot above, the Options dialogue is being used to select the Ourput Device – the device used to play the MID file, and the assignment of colours to the left and right hands (tracks 01 and 02). The Output Device list will be populated with any device your system recognises as able to play the MIDI file. With Musicarta MIDI files, you should not have to adjust the colour coding of the hands. 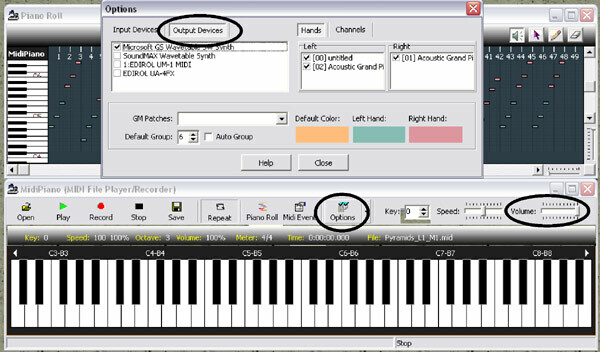 In the screen shot below, the Options dialogue is indicating what external devices are connected to input MIDI data, and which MIDI channels are in use. The Input Device list will be populated with any device your system recognises as able to input MIDI data. You can silence Channels by un-ticking them, and also adjust their volume here. The Options dialogue also specifies how many octaves your MidPiano keyboard shows (‘Default Group’). Leave this set at 6. 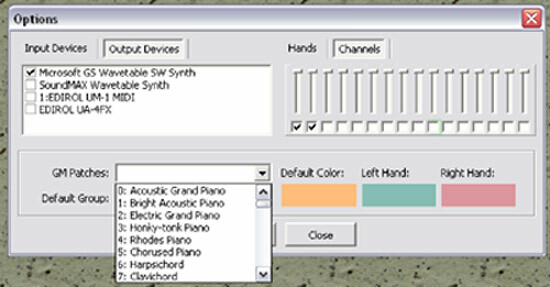 If you are using a software synthesizer (‘soft/SW synth’) to play your MIDI files, you can change the ‘voice’ it uses from the default Acoustic Grand Piano to any of the ‘GM Patches’ in the drop-down list. ‘GM patches’ stands for ‘general MIDI patches’, and agreed list of voices (‘patches’). 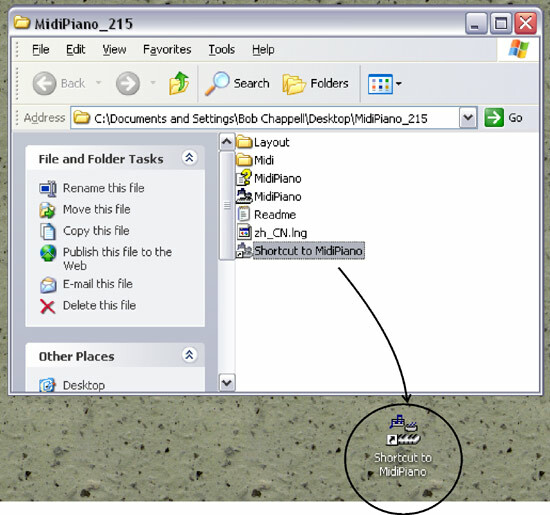 The Options drop-down menu has a facility (‘Keyboard’) for customising your computer keyboard for playing the MidiPiano, plus a ‘Stay on top’ option to keep the MidiPiano window visible at all times. 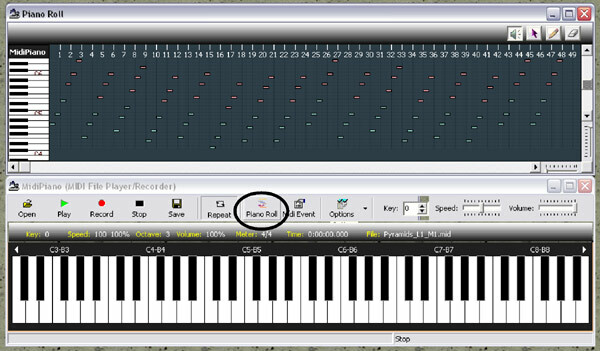 The Piano Roll pane will resize itself to show your MIDI file as well as possible. There are a number of additional ways you can adjust the view. Click and drag the very top margin to resize the window vertically. Use the vertical slider to determine which pitch notes are shown (high or low). Use the horizontal slider to determine which portion of a long file is shown. Use the two zoom controls at the bottom right to zoom in to an area of interest. The numbers across the top are crotchet (quarter-note) markers. Use together with the event list to identify particular MIDI events (notes). The four buttons at the top right allow you to play (click and drag), select, create and edit, and erase MIDI events in the Piano Roll pane. Seeing and hearing at the same time a piece of music you are learning is of great benefit – especially if you ‘just watch’ a number of repetitions. Play your track or example with the Repeat button set and just let it ‘sink in’ as you read through any accompanying lesson notes, or study the chord chard or written-out music. Use the Output Devices list in the options dialogue to make MidiPiano play files using the voices of your own MIDI keyboard and mute the left or right hand parts by un-ticking the tracks in the Options dialogue box – or you can just lower the volume in ‘Channels’. Then practice supplying the missing notes. Remember that you can slow the performance down until you can copy the performance on your own keyboard. The metronome speed (beats per minute) and the percentage speed are shown in the file information area just above the keyboard. Click in the progress bar to repeat a portion of the performance. Zoom in horizontally to find out which hand plays what, and when – without the distraction of reading the music. Seeing your target piece at maximum zoom out also gives you a good idea of the overall ‘shape’ of the piece, and whereabouts you are in it. This sense of orientation is a great confidence builder. Using MidiPiano regularly will develop your intuitive keyboard skills and help loosen your reliance on written music. Take time to learn to use the application. Make sure you always know where the shortcut to launch it is and where you keep the MIDI files for the lessons you are studying. So why not let MidiPiano and Musicarta help you become the keyboard player you know you can. Start with one of our digital home study packages and take it from there!